Nursing professor Miyong Kim has made it her mission to improve the healthcare services available to her countrymen in Baltimore--and beyond. 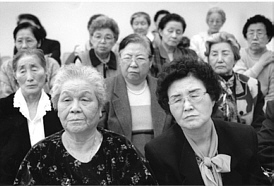 A group of 50 Korean American elders files into a classroom at Baltimore's Greenmount Senior Center. No chair remains empty-- not even the ones in the back or those placed against a side wall. The women, impeccably outfitted in dresses and pearl necklaces, whisper in Korean to each other and occasionally pat one another's knee. The men, much fewer in number, sit quietly in their tailored suits. All await the arrival of Miyong Kim, a first- generation Korean American and an assistant professor at the Johns Hopkins School of Nursing. As Kim enters the room, the men and women look toward her and smile. Kim smiles back, greets them in Korean, and then continues in their native tongue, "I want to talk to you today about diabetes, but first I'd like to know if you have questions about anything else." One woman raises her hand and asks whether eating foods made with soy could offer an alternative to hormone replacement therapy. Yes, says Kim, turning around to write on a dry-erase board in Korean. Tofu, bean paste, rice made with soy, soy bean sprouts--all of these Korean foods provide a good source of soy, an ingredient known to contain estrogen, she notes. As Kim moves the discussion to diabetes, a disease for which her audience is at particularly high risk, people get up one by one and walk toward postdoctoral nursing student Haera Han, who sits at a desk off to the side. Han is there to take their blood pressure. Each elder hands her a card and Han adds today's numbers to this monthly chart. "Everybody wants to have their blood pressure taken," says Kim later. "But I think they mostly want to have contact with us and tell us how they feel." After Kim's talk, several people approach her to discuss their health problems. As one woman describes the pain in her stiff back, Kim holds the woman's hand, runs her other hand over the woman's shoulders and then down her spine, and assures her nothing seems unusual. Another elderly woman pulls from her purse five bottles of medicine. She points to the label of each, typed in English, and asks Kim to explain what it's meant to treat. Most of the 250 Korean Americans registered at the Greenmount Senior Center do not speak English well enough to ask their physicians about their health concerns. "This is information they can't get from their doctors," says Kimo Nam, who has directed the center since it first opened in 1992. The language barrier also excludes these men and women from other important health services for which they may be eligible: Many, for instance, do not know they qualify for Medicaid or Medicare. Such barriers to health are increasingly problematic in Baltimore and in cities throughout the country, as immigration among Koreans has risen. Korean immigrants form one of the fastest-growing Asian subpopulations in the country. Since 1970, their numbers have increased more than tenfold; the group now represents about 11 percent of the total Asian-American population of 34.4 million. Most of the 250 Korean American elderly at the Greenmount Senior Center don't speak English well enough to communicate with their physicians. That's where Nursing's Miyong Kim comes in. Demographers estimate that around 35,000 Korean Americans live in the Greater Baltimore area, almost half of them in the city, according to Kim. "Next to African Americans, Koreans are the largest minority group in Baltimore," she says. Typically, Koreans settle in metropolitan areas such as New York City, Chicago, or Los Angeles, where they can find affordable housing, service-industry jobs, and, more important, immigrant communities. Such communities often include Korean lawyers, cab drivers, restaurant owners, clergy, and language interpreters who can aid them during the acculturation process. Once these families settle into American life, the younger generation often moves to the suburbs, where they perceive the schools to be better for their children; in many instances, elderly parents choose to remain in the city. Most who belong to the Greenmount Senior Center live either alone or with their spouse in a 20-story Korean American retirement complex just blocks away. Despite their increasing presence, Korean Americans remain an underserved population and continue to lack access to medical care. Kim, who arrived in the United States 16 years ago at age 26, has experienced firsthand the difficulties recent immigrants face. She has made it her mission to improve the healthcare services available to her countrymen, particularly the elderly. 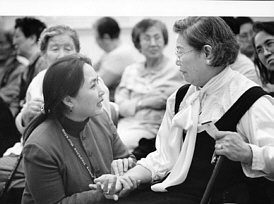 Over the past five years, the woman one colleague describes as "aggressive but humble" has conducted several studies of the elderly Korean American population in Baltimore, the first Hopkins effort ever to examine the health needs specific to this community. In one study, Kim found that only 82 of the 205 people interviewed received medical care when they needed it, and about 86 percent of those who did access care had difficulty obtaining it, primarily due to language problems. Kim, whose findings appeared in the Summer/Autumn 2000 Asian American and Pacific Islander Journal of Health, found that most could not make a doctor's appointment or arrange for transportation without help from a translator. She believes her study highlights the need for an emergency phone number for Koreans. "I've heard horror stories about children swallowing poison when their non-English-speaking Korean grandparents were taking care of them," Kim says. "At first the elders panic. They know they should call 911 but worry they won't be understood. Instead, they call their adult children, who then call 911." In many cases, however, the adult children can't be reached quickly or even at all. So Kim is working to formulate a service that would be operated by bilingual volunteers who could translate for Korean-speaking callers. "If it works out in the Greater Baltimore area," says Kim, "we'll extend it to other areas." "In my own small way," says Kim, "I've been successful in letting people know there's an isolated community that's suffering." Kim's study also showed that the language barriers could lead to harmful drug interactions. "They're taking both traditional Asian folk herbs and Western medications," says Kim, "and they're not telling their doctors." For example, American doctors routinely prescribe blood thinners for elderly patients to prevent heart attacks. But a patient who also takes certain herbal drugs, which could produce the same blood-thinning effect, runs the risk of uncontrolled bleeding. Kim has found that many elderly Korean Americans do not understand how often to take their medications, how much to take, or even why they've been prescribed. She recalls the case of an elderly man who was unknowingly taking two different high blood pressure medications. "The primary care physician had prescribed one and then a cardiologist prescribed a similar one," she says. And some people continue taking medication after it has expired; drug labels, written in English, offer no help. At the Greenmount Senior Center, Kim has addressed this problem by conducting regular medication reviews. When members first register at the center, director Nam makes a record of their current medications, including both Eastern and Western drugs. Every time a prescription is changed or added, the record gets updated, and Kim discusses the modifications with each senior. In the long term, Kim would like to set up a program that would bring visiting nurses right into the home to conduct such medication reviews. Kim is familiar with acculturation stress. Several years after emigrating to Tucson, Arizona, where her husband "Kim" Kim attended graduate school at the University of Arizona, their 3-year-old son, Brian, accidentally sprayed oven cleaner in his eyes. Kim immediately whisked the toddler into the shower, rinsing his eyes. Afraid there could be permanent damage, she rushed him to a local emergency room, where about 20 other people were waiting. Kim filled out the paperwork and then anxiously waited. "I shivered as I sat in a chair holding Brian," she recalls. The longer she sat, the more worried and impatient she became. "I wanted to demand to see a doctor right away, but I feared I wouldn't be understood," she recalls. "I was torn between being an anxious mom and feeling like an idiot." Mustering up her courage, Kim finally talked to a nurse, who said she would have to wait. "I know she said that to everyone else, but, like many new immigrants, I personalized it," Kim explains. After an hour, a doctor finally examined Brian and concluded to Kim's relief that he would be fine. In her study of Baltimore's elderly Korean Americans, Kim found that just 82 of the 205 people interviewed received medical care when they needed it. During her years in Tucson, which had no real Korean community, Kim also recalls deeply missing her parents and two younger brothers. "I had mixed feelings about leaving Korea," she recalls. "I was really excited to have the opportunity to meet people who grew up in a different environment, but I didn't want to leave my family--we were particularly tight." Though she could lean on her husband for support, Kim felt isolated. She looked forward to moving back to Korea once her husband completed his PhD in sociology. But the Kim family ended up spending another 11 years in Arizona, in part so that Miyong herself could earn her PhD in nursing research from the University of Arizona. "I thought, 'Maybe it's my turn to study,'" she says. In the beginning, though, she intended to take only a few courses. One of her first was in women's studies. "I fell in love with this country when I took a class in feminism," she says. "I grew up in a country where everybody thinks alike, looks alike, and even eats the same food. In America, there is this tolerance of diversity." Despite her admiration for the United States, she was reluctant to become one of its citizens. "Every year, I'd ask myself, 'Are you ready?' I never was because I felt like I'd be divorcing Korea," she says. "But five years ago, I asked myself again. That year, I said yes." Kim, who had observed the American political process for almost a decade but was unable to participate in it, wanted to vote. Though Kim already had experience in nursing--she had worked at a U.S. Army base in Korea--she opted to pursue nursing research. "I wanted to present sound, scientific evidence that Korean Americans are suffering and that there is a need to improve the situation," Kim says. So in 1996, when her husband said it was her turn to decide where to move, Kim searched for teaching and research opportunities at American universities. "I wanted to be at a school located near Korean American communities so I could work with them," Kim says. That year, she and her family moved to Baltimore, where Kim accepted an assistant professorship at Hopkins's School of Nursing. She was attracted by the school's emphasis on community health nursing through which 500 students and faculty volunteer nearly 12,000 cumulative hours each year to provide immunizations, preventive health screening, referrals, and health education classes. The school operates 40 community health programs and four Baltimore City clinics: the Lillian Wald Community Health Nursing Center, the Clinic at the House of Ruth Shelter for Abused Women, the Clinic at St. Bernardine's School, and the Clinic at Hillside Park Apartments. Kim expects her efforts at the Greenmount Senior Center to become a regular program for the school as well. Kim's goal: Creating an environment for "culturally competent care" among American healthcare providers. In the classroom, she talks to community health students about Korean American cultural issues in healthcare. "There needs to be cultural training on both sides," says Kim, who wants to create an environment among American healthcare providers of what she calls "culturally competent care." When her son Brian was born, Kim experienced the hard way what a cultural difference can mean. The maternity ward nurse noticed that the young mother did not ogle her baby. "The nurse made a note on my chart that said I had a bonding problem," Kim recalls. "But in Korea, we're taught to not openly show our affection. Instead, we feel it on the inside." The nursing staff referred her to a course to improve her emotional connection with her son. For her own cultural enrichment, Kim agreed to enroll. "But after two or three sessions, I couldn't take anymore," she says. "I called the instructor and said, 'Please, I don't have a bonding problem.'" School of Nursing instructor Kate Lears regularly invites Kim to speak to her class on Dimensions of the Nursing Role. "There are a lot of cultural variations, not just in assessing and communicating," says Lears. Students learn, for instance, that assigning a Korean American to Room 4 is ill-advised: among Koreans, this number symbolizes death. Similarly, healthcare providers should avoid writing a person's name in red ink: Koreans do this only after a person dies. The discussions Kim leads emphasize the importance of providing care based on both cultural and medical needs; she says her talks help sensitize students to healthcare needs unique to other ethnic populations as well. 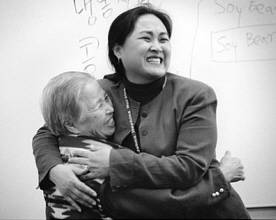 Kim wasn't sure what kind of reception her efforts in the Korean American community would get at Hopkins, and was therefore pleasantly surprised in 1998 to receive a grant from the fund for Geriatric Medicine and Nursing to conduct a study of coronary heart disease among elderly Korean Americans. The results of her studies have prompted other Hopkins faculty to get involved in the Korean American community. Among them is Hee-Soon Juon, assistant scientist at the School of Public Health, who is examining the cancer screening behaviors among Korean American women. "In my own small way," Kim says, "I've been successful in letting people know there's an isolated community that's suffering." Currently, Kim is conducting a pilot self-help program involving 40 local Korean American elders with hypertension--a follow-up to a study she did showing that Korean Americans in Baltimore were at relatively high risk for hypertension. Some 33 percent of the 18- to 89-year-olds she surveyed suffered from hypertension, compared to 24 percent among Americans and 22 percent among Koreans living in Korea. Perhaps most distressing, only 40 percent of the Korean Americans with high blood pressure were taking medication for it--and just one-quarter of that group was controlling it. During Kim's current eight-month study, which began in January, elderly participants will learn about the risks of high blood pressure and how to conduct at-home screening; they'll also talk weekly to a bilingual nurse over the phone. 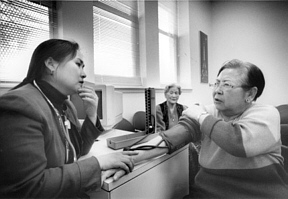 "The insights gained should help us develop effective, culturally sensitive high blood pressure programs for Korean American elderly throughout the U.S.," Kim says. Back at the Greenmount Senior Center, Kim spies a familiar looking figure. She approaches a frail man in his 90s and asks him in Korean where his wife is. The two have been married for 70 years and she is used to seeing them together. As the elderly man begins to explain about back problems that have kept his wife at home, Kim walks toward him until the two stand just inches apart. Then she gently takes his fingertips in her hand. He looks at her and smiles. Emily Carlson is a graduate student in The Writing Seminars and is the magazine's first Corbin Gwaltney '43 fellow.